Are healthy supplements truly necessary to take on a daily basis? Some would say yes, they are essential to good health, whereas others would say it’s not necessary if you are getting your nutrients from food. One thing that’s important to understand is that companies who manufacture supplements are not held to any industry standard. This means that the pill you take may or may not contain what the label on the bottle says it contains. So, based on this information, how can you go about choosing supplements wisely? Visit the website www.consumerlab.com to see if the brand of vitamins or supplements you’re considering have passed their independent tests. Always read the labels – the first three ingredients are what make up the majority of the supplement. It’s best if you can read the names of all the ingredients! Don’t be afraid to ask the store manager what they know about the brands of supplements they carry. The expiration date should be at least 30 days out from the date of purchase. Does the supplement contain lead or mercury traces? Reputable companies who manufacture supplements will gladly answer any questions you have about their product, so give the company a call and inquire to your heart’s content. There are some fantastic pomegranate supplements on the market for those who prefer to get their nutrients in a pill form or who simply find it is easier to include these in their diet rather than always eating the actual fruit. How are pomegranate supplements beneficial? Take your time to research the supplements on the market before making any final purchase decisions. You’ll be glad you did! 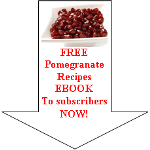 Read enough about healthy supplements and want to discover more about better life with pomegranate?